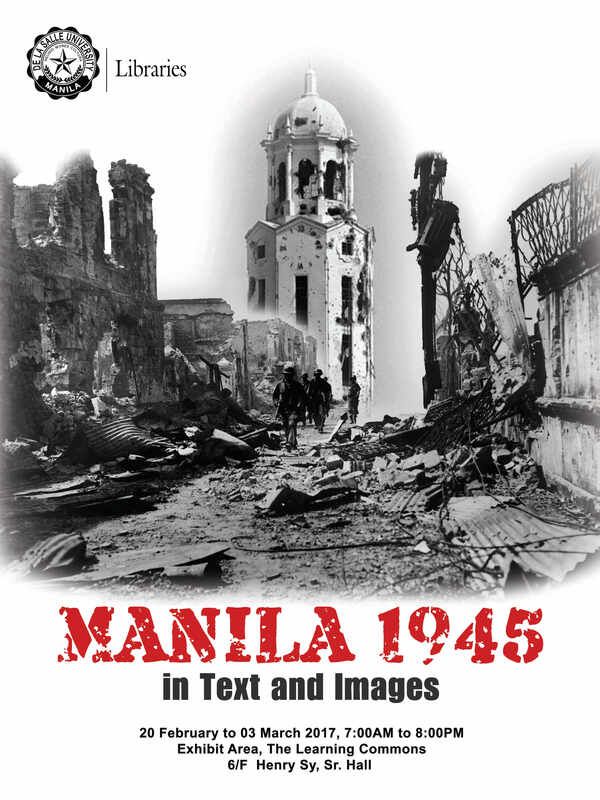 In commemoration of the Liberation of Manila, the DLSU Libraries is holding an exhibit entitled “Manila 1945 in Text and Images” at the 6th floor Exhibit Area of The Learning Commons, Henry Sy Sr. Hall. This exhibition will feature selected images and works taken during the Battle of Manila from the holdings of the Libraries. The exhibit is intended to remind the academic community of a critical period in the history of the nation and the sacrifices that both the armed forces and civilian population endured during the Second World War. Currently, the Libraries have a Special Collection on War Years, consisting of 88 volumes of books on World War I and World War II, located on the 13th floor of The Learning Commons. In addition, 260 titles or 501 volumes of books on World War II are available in the Filipiniana Collection (10th floor HSSH). The exhibit will run from 20 February to 03 March 2017, 7:00AM to 8:00PM and is in line with Proclamation No. 653, s1993.